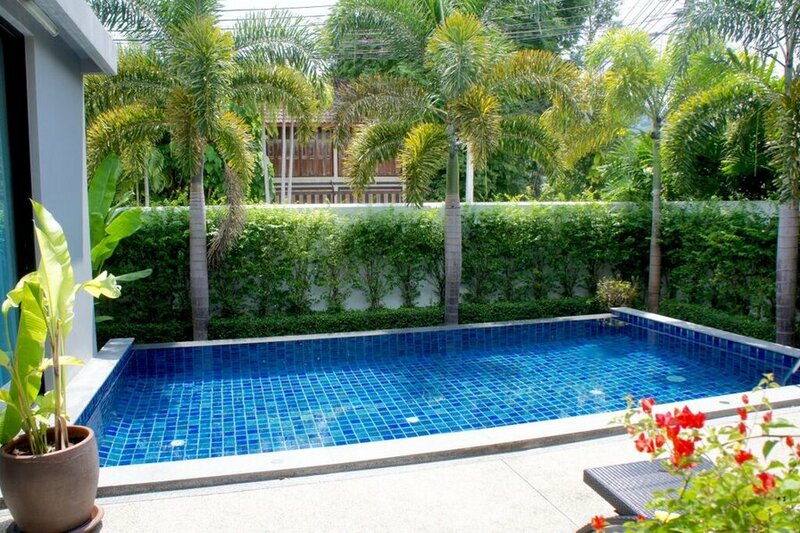 This new villa is located in Baan Bua Residence - one of the closest to Nai Harn beach private estates. It will accommodate comfortably 6 adults and 2 children up to 12 years old. This new villa is located in Baan Bua Residence - one of the closest to Nai Harn beach private estates. It is set in a quiet scenic place amongst tropical greenery and lakes, yet only a few minutes’ drive from shops, restaurants and a most beautiful beach. The villa is perfect for families or sharing couples. It will accommodate comfortably 6 adults and 2 children up to 12 years old, and will suit well both for short breaks and longer stays. Living room is equipped with flat-screen TV, DVD and Blu-ray players, HD multimedia system. You will access to satellite TV channels and Wi-Fi Internet. All bedrooms have king-size beds and private bathrooms with shower, and with bathtub in the master bedroom as well. There is an additional guest washroom. Kitchen is equipped with high-end appliances, and there is a separate laundry room with washing machine. In the backyard of the villa you will find a 7x4m swimming pool with sun lounges and direct exit to a tropical park inside the estate. The estate is securely guarded for your safety. Nai Harn area has a choice of restaurants and cafes that serve Asian and Europian cuisine. Nearby beaches offer snorkeling, diving, boat tours and a lot of other activities.